The inside of the 93,000-square-foot building at 48 Corliss Ave. will be completely renovated into a state-of-the-art facility. 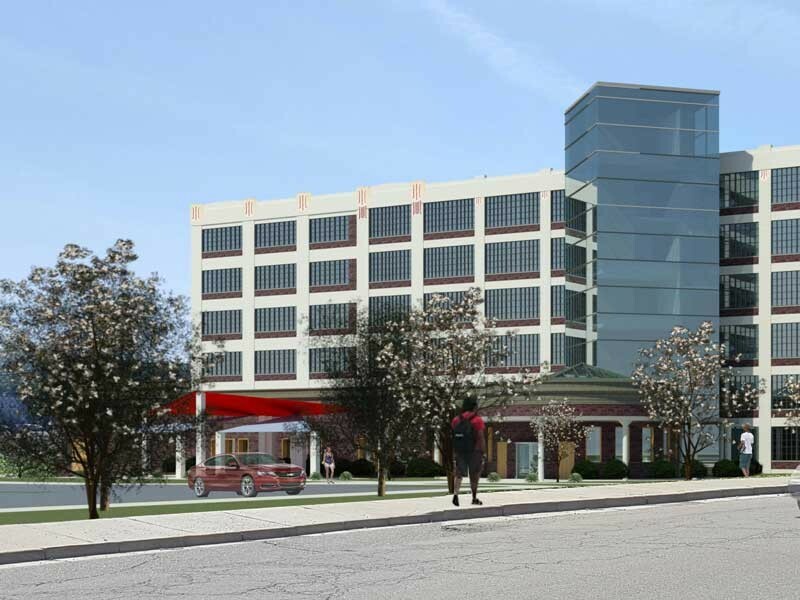 Architectural rendering of the former Endicott Johnson shoe and carton factory that is being completely renovated and will be home to Binghamton University's college of nursing and health sciences. In less than two years, an old Endicott Johnson Shoe Corp. factory in downtown Johnson City, N.Y., will be the new home for hundreds of Decker School of Nursing students when the school relocates to Binghamton University’s Health Sciences Campus. According to Architectural Design Supervisor William Hall III, lead architect on the project, the inside of the 93,000-square-foot building at 48 Corliss Ave. will be completely renovated, and an addition in the rear of the building will be demolished. A new, 20,000-square-foot addition will be built, providing 113,000 square feet of classroom, clinical laboratory, simulation and research space. Name game: The building at 48 Corliss Ave. was originally called the Endicott Johnson Pioneer Annex and was built in 1916. Simulation innovation: Decker became the first nursing school in New York to have its simulation center accredited when the school’s Innovative Simulation and Practice Center achieved accreditation in 2017. Student bodies: Most of the nursing students in the new building will be juniors, seniors and graduate students since freshmen and sophomores will be completing general education requirements on University’s Vestal campus. Good eats: The first floor will feature a food court (the only one on the Health Sciences Campus) that will have plenty of wood, brick and windows. Research center: The Kresge Center for Nursing Research will be located on the fourth floor, along with the dean’s suite. Easily accessible: Binghamton University’s Health Sciences Campus in Johnson City is just 2.3 miles from the Vestal campus. Adaptable: A large (200-seat) classroom/event space on the first floor can easily be broken into two smaller rooms with the use of a vertical folding wall. Since the 102-year-old brick building is on both the New York state and national registers of historic places, Binghamton University’s plans had to be reviewed and approved to ensure historical preservation. Hall says the existing part of the building will be historic in feel with an industrial look, while the new portion will have a modern look and feel. The ground floor of the six-story building will feature a food court, lounge, information commons, library, help desk, academic advising suite and a large multipurpose room with its own kitchen (the food court will also have a kitchen). The multipurpose room can be used as event or classroom space. There will also be a gallery celebrating the building’s history. Decker’s Innovative Simulation and Practice Center (ISPC) will occupy the entire second floor. Simulation spaces will be substantially larger, including debriefing rooms and much-needed storage for the center’s high-fidelity mannequins. Practice spaces will also increase and include a 19-bed learning lab set up as a hospital unit with a classroom in the center. Patrick Leiby, academic technology specialist within Decker, and Patti Reuther, ISPC director, worked for almost two years to plan the space to not only meet the simulation and practice demands for Decker students, but also to increase the center’s ability to provide services to area healthcare organizations. The ISPC is accredited by the Society for Simulation in Healthcare in the area of teaching/education. The remaining four floors of the building will be dedicated to offices and classrooms. The fourth floor will also be home to the dean’s suite and the Kresge Center for Nursing Research, and the third floor will include a studio for high-quality recording of online courses. Cleaning, asbestos removal and design work are complete. Contracts went to bid in the fall. Once the bidding process is finished, Hall expects construction to take 15–18 months. If all goes as projected, the building should be ready for classes to begin in August 2020. 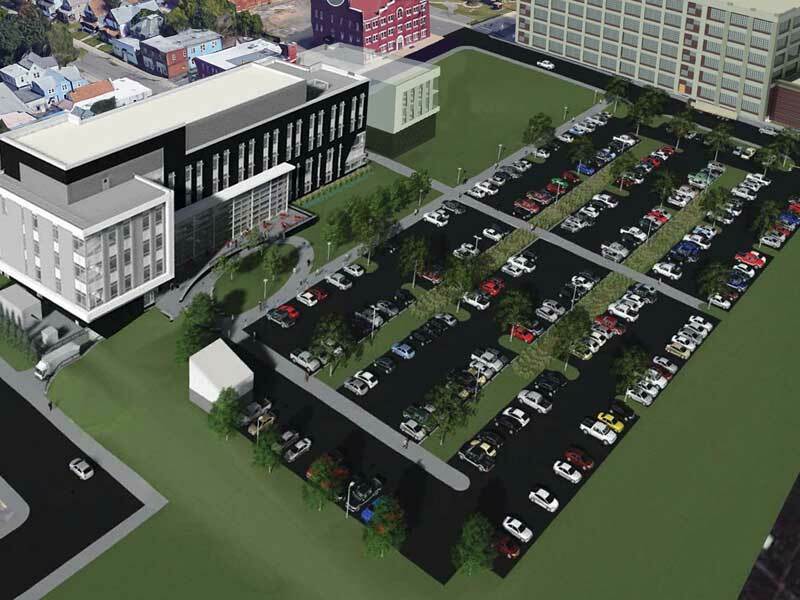 This architectural rendering of Binghamton University's Health Sciences Campus in Johnson City, N.Y., shows the Decker School of Nursing (upper-right corner) and the School of Pharmacy and Pharmaceutical Sciences. The pharmacy school opened in 2018; the college of nursing and health sciences will open in 2020. The 11-acre Health Sciences Campus is home to Binghamton’s School of Pharmacy and Pharmaceutical Sciences, which opened in July 2018. A research and development building for the pharmacy school is in design and planning stages. The anticipated relocation of Decker in 2020 will coincide with the opening of a wellness center for seniors. Locating these schools and programs on a single campus will facilitate research and education, bringing together pharmacists, scientists, nurses and social workers who will expand curricular offerings into new, allied health programs and solve challenging healthcare problems. Thanks to a gift from Anne A. Hubbard, the Decker School is creating the Ford Family Wellness Center on Jennison Avenue, near the Health Sciences Campus. Consistent with Decker’s mission, the center will provide integrative, primary healthcare and holistic health and wellness services to the community through collaborative partnerships. New York Gov. Andrew Cuomo and lawmakers provided $60 million for the School of Pharmacy and Pharmaceutical Sciences in the state budget. The state’s Upstate Revitalization Initiative provided $21 million to renovate the facility for the Decker School of Nursing and nearly $15 million for the pharmacy school’s R&D building. The remaining funding for the R&D facility comes from state capital funds and a SUNY Empire Innovation Program grant. One such partnership will be with Lourdes Ascension in Binghamton, which is part of the Institute of Health Improvement and the Hartford Foundation’s national move to age-friendly health systems, which focus on the specific needs of an aging population. Decker and Lourdes intend to combine their expertise in geriatrics and health systems, bringing physicians, nurses, social workers and pharmacists together to enhance patient care for the elderly. This will help Lourdes to grow its geriatrics practice and improve patient outcomes, while giving Decker the chance to expand its Elder Services Center to better meet the needs of seniors and their caregivers. In addition, says Donald Nieman, provost and executive vice president for academic affairs, the center will allow the University to expand the range of clinical placements, as well as provide a location for nurse practitioner faculty to practice, which is essential for maintaining their professional licensures.